Friday’s Five Favs ~ Great Reads for the Weekend! Posted by Raven Bower on June 08, 2012 in News, Uncategorized | Comments Off on Friday’s Five Favs ~ Great Reads for the Weekend! This week’s top five picks for weekend reads! Their passion is undeniable, irresistible—and it may change the fate of humankind. 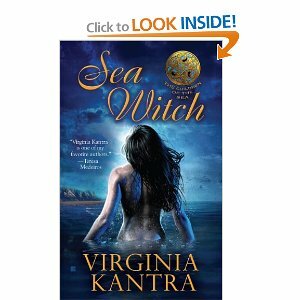 See my review of Sea Witch here. 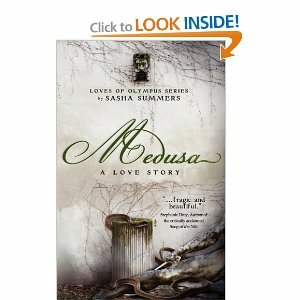 Medusa, A Love Story by Sasha Summers ~ It’s said love can change a person. Medusa wasn’t always a monster… Medusa is ruled by duty, to her Titan father and the Goddess Athena. She’s no room for the tenderness her warrior guard, Ariston, stirs. When Olympus frees her from service, her heart leads her into the arms of the guard she loves… and curses her as the creature with serpent locks. Ariston goes to war with a full heart… and dreadful foreboding. He learns too late of the danger Medusa faces, alone, and a Persian blade sends him into the Underworld. But death, curses, nor the wrath of the Gods will keep him from returning to her. Poseidon will use Greece’s war to get what he wants: Medusa. He does not care that she belongs to another. He does not care that she will be damned. He is a God, an Olympian, and she will be his. See my review of Medusa, A Love Story here. Hooked by Les Edgerton ~ The road to rejection is paved with bad beginnings. Agents and editors agree: Improper story beginnings are the single biggest barrier to publication. Why? If a novel or short story has a bad beginning, then no one will keep reading. It’s just that simple. 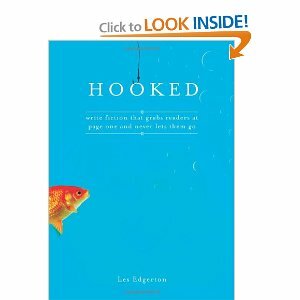 In Hooked, author Les Edgerton draws on his experience as a successful fiction writer and teacher to help you overcome the weak openings that lead to instant rejection by showing you how to successfully use the ten core components inherent to any great beginning. See my review of Hooked here. 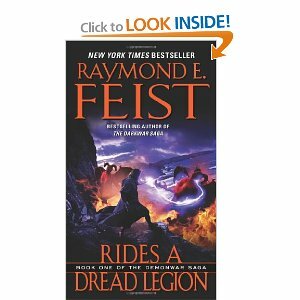 Rides a Dread Legion by Raymond Feist ~ The first book in a brand new series by the master of epic fantasy, Raymond E. Feist. Ten years after the cataclysmic events of Wrath of a Mad God took place, Midkemia now faces a new danger thought buried in myth and antiquity. A lost race of elves, the taredhel or ‘people of the stars’, have found a way across the universe to reach Midkemia. On their current home world, these elves are hard pressed by a ravaging demon horde, and what was once a huge empire has been reduced to a handful of survivors. The cornerstone of taredhel lore is the tale of their lost origins in the world they call simply ‘Home’, a place lost in the mists of time. Now they are convinced that Midkemia is that place, and they are coming to reclaim it. Ruthless and arrogant, the taredhel intend to let nothing stand in their way; but before long, Pug and the Conclave realise that it’s not necessarily the elves, but the demon horde pursuing them where the true danger lies. And hanging over Pug always is the prophecy that he will be doomed to watch everyone he loves die before him! Review forthcoming, but Rides a Dread Legion wouldn’t on this list if it wasn’t a worthy read! 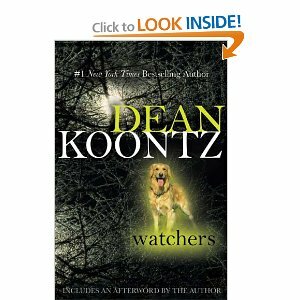 Watchers by Dean R. Koontz ~ On his thirty-sixth birthday, Travis Cornell hikes into the foothills of the Santa Ana Mountains. But his path is soon blocked by a bedraggled Golden Retriever, who will let him go no further into the dark woods. That morning, Travis had been desperate to find some happiness in his lonely, seemingly cursed life. What he finds is a friend, a dog of alarming intelligence and a threat that could only have come from the darkest corners of man’s imagination. Review forthcoming – the only fiction book I’ve ever read not just twice, but thrice!